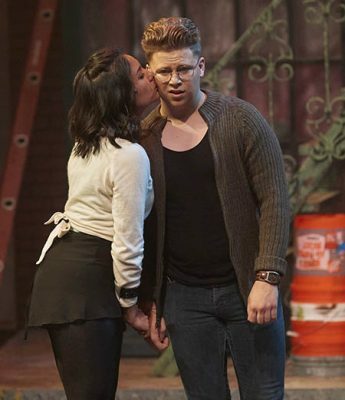 Tarnim Bybee (left) places a gentle kiss on the cheek of Micah Larsen, another company member, during one of the musical numbers. Imagine learning about the book of Matthew. Now add in some song, dance, an interactive experience and some modern twists, and you have Ethington Theatre’s final play of the semester. 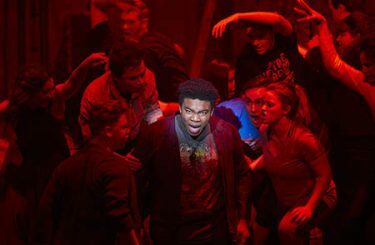 “Godspell” is a musical based on the book by John-Michael Tebelak that depicts the life of Jesus Christ through parables. 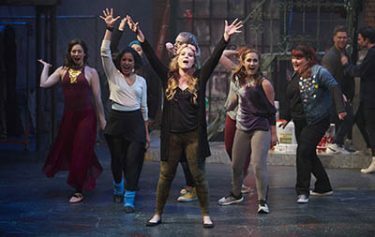 Grand Canyon University’s performance was directed by Joanie Colson, who teaches theatre education on campus and is new to Ethington Theatre’s list of directors. “It was very nice to bring in someone new to direct, and Joanie brings many years of directorial experience,” said Claude Pensis, Dean of the College of Fine Arts and Production. Audiences will be greeted with a bright and colorful city set, filled with shop signs and buildings and even details as small as graffiti on the walls. 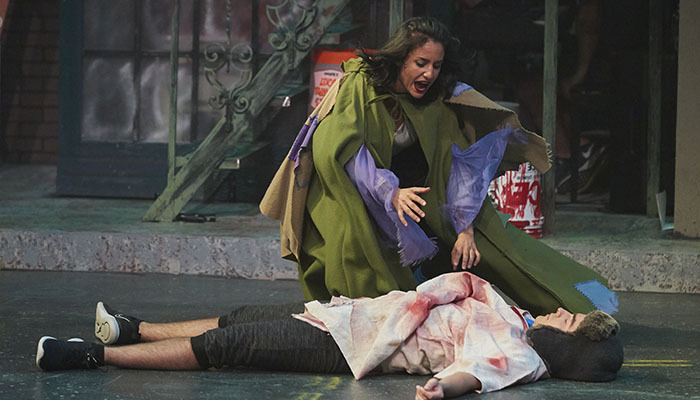 The production changes its tone throughout the performance, seeming whimsical at some points and taking a more serious tone when tackling the heavier topics within the story. Throughout the musical, the Theatre Department pulls audiences into the stories, both figuratively and literally. Cast members venture off the stage and, in a sense, make the entire theatre part of the set and interact with audience members as if they also are in the story. “There’s a lot of audience interaction. In fact, we will be bringing two or three audience members on stage and utilizing them in the play,” Pensis said. Ryan Ardelt (front) and his fellow castmates participate in a well-rehearsed piece of choreography. It also allows the 17-member ensemble to provide a modern tone to the performance. 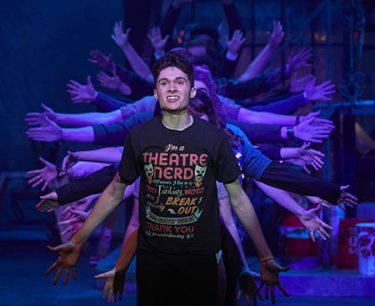 As a musical, the performance tells the stories through a series of catchy songs composed by Grammy and Academy Award winner Stephen Schwartz, of “Wicked” and “Pippin” fame. Viewers will get to experience the piano performed by Mark Fearey, beatboxing and a band for a more rock kind of sound to accompany the vocals. Bradford said playing the role of Jesus has really taught him a lot about himself and allowed him to better understand Jesus’ story. “One of the things that I definitely felt throughout this entire process was an understanding of what it was like to go through some of the situations,” he said. The Theatre Department has worked to create a warm and inviting experience for their audience, opening the production for anyone who would like to see it.